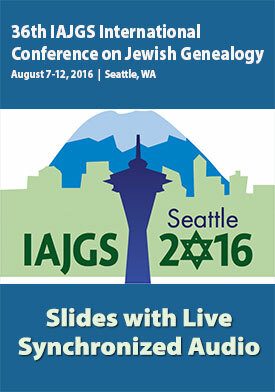 2016 International Conference on Jewish Genealogy conferenc recordings. This package features video of PowerPoint slides with Synchronized live Audio for most sessions sessions and audio of all permitted sessions listed below. Only audio and slides where the speaker has given permission are being recorded. Listen to the presenter audio and watch the slides, exactly as is happened live. This package allows you to review presentation materials and is a lasting valuable resource. Plus this package includes the MP3 Audio files of all sessions to listen to on your computer iPod or MP3 player.